Are you ready for it? Did you even know that it had started? It has, so get your mind right. 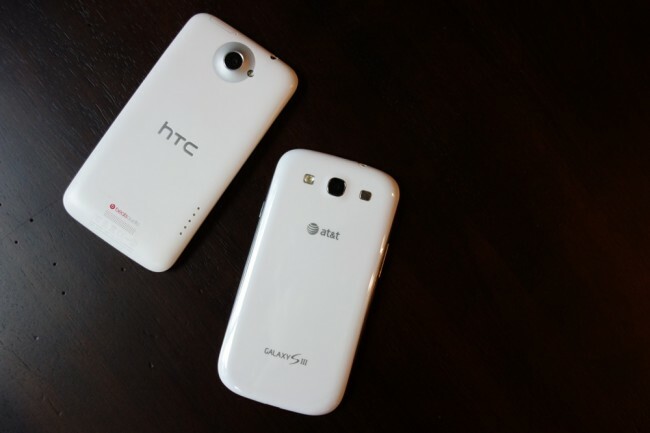 The battle between HTC and Samsung for 2013 is already underway and we’re excited about it. Thanks to the announcements of flagships from both companies, March is going to be a wild month for smartphone lovers, particularly those with an addiction to the latest and greatest running Android. HTC is trying to survive and to recapture some of its lost marketshare, while Samsung will only attempt to continue on in their dominant ways, pushing all attackers aside. It may get dirty, there may be insults floated about, battery juice tossed in eyes, and Gorilla Glass sharpened like knives, but that’s the beauty of any competition. Let’s talk about the next few months from both companies and how their launches won’t go down without a fight. A week after HTC unveiled their new flagship, the One, which they claimed would arrive in March, Samsung decided there would be no better time to announce their own new flagship than days before HTC’s hits store shelves. Only, in typical Samsung fashion, they will make sure the entire world knows about it with a streamed launch through YouTube and in Times Square. In a way, I feel a bit sorry for HTC. The One looks to be an incredible device, however, I’m just not sure how you can compete with the global takeover that Samsung has managed over the last two years. They have what appears to be an unlimited marketing budget, a brand that people associate themselves with, enough innovation to keep even the techiest of tech nerds coming back for more, and LeBron James. HTC throws an aluminum counter-punch. Samsung stepping on the One’s launch toes or not doesn’t seem to have phased HTC much. In fact, through their official Twitter account they sent their own message, telling followers to “Say no to plastic.” As you know thanks to our coverage, the One is made up of a zero-gap aluminium unibody casing, while Samsung has stuck to their plastic ways for years. Yes, this Tweet was a direct shot at the “cheap” stigma that has stuck to Samsung’s products even though they have been remarkably successful. 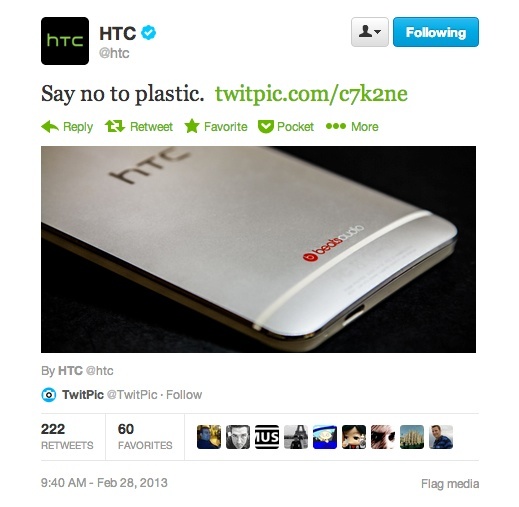 The only thing missing from this reaction is a classy “Use the hashtag #saynotoplastic!” Thank you, HTC, for not stooping that low. Can’t beat ’em, join ’em. HTC admitted that they failed with last year’s One series in part because their marketing was terrible. This year, their plan is to put the One in your face as much as possible, to make the One brand a household name as much as Samsung’s Galaxy or Verizon’s DROID are. In attempting to accomplish this task, they have taken a page directly out of Samsung’s Marketing 101 book and decided to come up with a confusing/silly/wtf catchy name for all of their sub-products within the device. With BlinkFeed, BoomSound, UltraPixel and Zoe, HTC will certainly have plenty of material to use those marketing dollars on. Much like Samsung’s S Pen, S Voice, and S Beam, HTC is going to try to get you to remember what their new phone is capable of from an experience stand point, not how many pixels are in its display or clock speed of the processor. Can’t say I blame them for making this move, I just wish the names made more Sense (hah, get it?). The problem HTC faces with the One, is the fact that Samsung is already that household name, much like Apple. The guy sitting next to you on the train will probably refer to his Galaxy S3 as “the new Galaxy.” He likely doesn’t know what the processor is, how much storage is on board or what the model number is – he just knows that Samsung makes it and he’s bought into their way of thinking. I hate to compare Samsung to Apple, but at this point, they are the closest thing to it in more ways than I think many of us care to see. But on that note, Samsung can follow Apple’s lead by releasing a Galaxy S4 that looks similar to the previous model and offers little bump in hardware, but will still sell like none other. Apple took grief over the iPhone 5 being nothing more than a slight increase in selective areas yet they managed to sell the device in record numbers. Samsung is now in a position to do the exact same thing and get away with it, should they so choose. Picking a winner in this battle is quite difficult. For HTC to succeed, they need to see an adoption rate at which they haven’t in over a year. They need their device on billboards, on TV, in magazines, as a urinal cleaner-puck-thing, and anywhere else that can get you to notice it. But beyond marketing, they need to see numbers come back to their favor. They don’t need to outsell Samsung, because that’s an impossible task, but they do need to convince tech users that their product is once again worth keeping an eye on. Samsung on the other hand needs to continue on along the same path. It would be pretty tough for them to screw this thing up. In fact, HTC taking jabs at them probably means very little. There is still only one company that Samsung competes with, and that’s the one headquartered in Cupertino. No matter what, it’ll be entertaining to watch both of these companies try to grab your attention over the next few months.